What are the breakthrough ESOPs that you structured? The first ESOP I ever did was for a company here in Chicago. I did some ESOPs before, but they weren't leveraged, they were just employee benefit plans. The first truly leveraged ESOP that was used to buy stock in a company was a relatively small company in Chicago. It was used to generate liquidity for two brothers that inherited the business from their father. It's been very successful, they're still clients of ours after all these years. We did that one in 1985, and now the two brothers no longer have an ownership interest – one passed away, the other was bought out, and it's now being run by the third generation of the family. The ESOP owns the majority of the stock. I'm not, unfortunately, allowed to disclose the name of the company without the consent of the clients themselves. They couldn't have done the transaction any other way; in fact, when one of the two brothers decided to leave the business, the ESOP was used to buy out that brother, and this allowed the company to remain in the hands of the family and the employees. This wasn't one of the earliest ESOPs done... Were there any particular challenges in dealing with the family, helping them be comfortable? ESOPs first formally came into law in 1974, when ERISA was enacted. There were plans called ESOPs before that time, but there were just stock bonus plans or profit sharing plans that were invested in company stock. Really, ESOPs were formalized in 1974. Between 1974 and 84 they weren't really very attractive to many businesses and business owners, because the tax benefits were very modest. It wasn't until 1984, 10 years after ERISA, that Congress enacted substantial tax benefits, and those were expanded in later tax legislation. 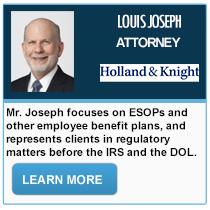 Although I had done a little ESOP work before that, it wasn't really until after the 1984 tax legislation that I became particularly active. I forget the name of it, they always call them the “Tax Reform Act” of something, but it was in '84. That's when the ability to sell stock tax-free came in, which was the principal driver. There were other rules – they gave a break to lenders for making ESOP loans, and there were other provisions that came in, but this was the real breakthrough that made transactions attractive from a tax standpoint to the selling shareholders. I had done a little ESOP work starting in 1974, but the ESOP work before that date was mostly non leveraged plans that were put into place because the business wanted to give its employees some share of stock ownership, but they weren't leveraged ESOPs, they weren't transactions where the controlling stockholder was bought out – they were just employee benefit plans. This was a new thing back then, a transaction that was tax-free to the selling shareholders was relatively new, the tax benefit to the lender was relatively new, it was about a year old at the time we did this transaction, so we were all feeling our way along, trying to figure out how to do it as we went. We didn't have a lot of forms or anything, because we were making it up as we went along. Did that translate into the subsequent ESOPs? Well, no two deals are the same, but they tend to follow patterns, and we developed some additional expertise on each transaction we did. What public companies were you involved in? I can mention the name of one of our private clients, since they themselves announced it publicly at the time. 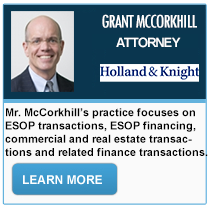 We did an ESOP for Cargill Incorporated in 1991-2, and it was large at the time – about 750 million dollars. It was particularly challenging since it was a big company and a big transaction, and that made it complex. I don't remember how many employees they had, but it was well into the tens of thousands. Were you helping to advise them on communication with employees? We advised them on how to put a team together to get the transaction done. I can remember some of the advisors. We had a working group and we discussed adding members to the teams, though I don't remember exactly who recommended whom. I can remember some of the players involved, but not how they joined, whether the company brought them in or other members did. Were there breaking points in the deal, that we can share? How about in terms of communication with employees? Now, you don't need to get consent of employees, an ESOP is an incremental benefit, so even if you did go to employees, why would they turn it down? The employees weren't really involved, I'm sure they were delighted to have this new benefit plan that has turned out very favorable to them. I think it was always assumed this would be great as far as the employees were concerned. What stories are you at liberty to tell us? One I can talk about, since it's a public company, is United Airlines. In United, we represented the pilots' union, which initiated the transaction. It was a breakthrough deal, since it was an employee-initiated ESOP. The pilots had a very bad relationship with the company, and they saw, as the only way to resolve the issues with the company, buying the controlling interest in the company, which would and did continue being publicly-owned. Anyway, the employees – not just the pilots, but the employees' union and non-contract employees – ended up with a 53% interest in a publicly held company. That was a very complex transaction which went over a period of years, it was difficult to negotiate. Although it was not a hostile takeover, I can't say that it was a friendly transaction, initially. The way we got involved was when we were approached by the pilots' union. There was a lawyer who had been representing the union for many years in litigation, and he recommended our firm to advise the pilots in doing an ESOP. Do you remember the initial call? Was it an unprecedented thing to hear? Well, actually, it's not true that there had never been an attempt at employee-initiated buyout before. One recent one that came to us was by the employees of Continental Airlines, though back then it was Eastern Airlines, and later they got bought out by Continental. The employees were attempting to resist the purchase by Continental, and we were engaged by a coalition of three unions to put together an ESOP as an alternative deal. That deal failed. In fact, it went into litigation, and one of the lawyers that we worked with remembered us from that Eastern Airlines transaction, saw the similarities and brought us in. The deal was a lot of fun, because it involved going around the country. At the time, there were thirteen cells – locations where the pilots were located – and numbers of our firm had to go in person to all of the thirteen. I pulled the short straw and didn't get to go to Honolulu. It wasn't literally by straws – it was pretty informal, everybody pulled out their calendars, and they had certain dates when they had to be in various places, and people just sort of spoke up. As I recall, one of my partners really wanted to go to Honolulu, so we gave it to her. There were a lot of presentations to employees. This was one transaction where the employees were very important, because they were putting in some of their own retirement funds to help the ESOP out, and making wage concessions – that was one way to finance the transaction. They were very much involved in that one. They had a lot of questions whether this would really work, and what if they changed the tax laws, and had anybody ever done this before. Each pilot was asked to put up $5000 out of their own pockets, and it was non-deductible and non-refundable. Initially, I was very skeptical about raising money with that method, but sure enough, the great majority of pilots wrote non-deductible and non-refundable checks for 5000 dollars each. I think that mechanism really got them to feel that they had some skin in the game, and this was a serious thing, and they were really behind it. This is very unusual, and in fact, I think it's unique – I have never seen this in any other transaction. I think in many ways, the United Airlines transaction was unique. It gets an unfair treatment in the press, because the old United eventually went into bankruptcy after 9/11, with all the other airlines except American – although the latter has also since filed for bankruptcy. Of course, the ESOP being an equity investor, it pretty much got wiped out. But before that, it was a very successful ESOP for more than a decade, and in fact just a year or so before, it won an award from the ESOP Association for being the best ESOP in the United States. A lot of employees made a lot of money, and the reason that the company went into bankruptcy had certainly nothing to do with the ESOP – it was despite the ESOP, not because of it. They went into bankruptcy because of what happened in the airline industry following the terrorist attacks in 2001. They went bankrupt, and they had a lot of company. 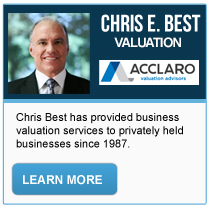 Who was the first ESOP valuation firm? The first ESOP valuation firm I ever dealt was Houlihan Lokey. It's a major middle-market investment banking firm now. At the time, in the mid-1980s, they were a much smaller firm, and I'm not even sure whether they had any offices outside their Los Angeles center. But they had people who did ESOP work and were learning on the job. I think it may have been a factor of proximity, since the vortex of ESOPs back then was probably in California, both northern and southern, and that had something to do with it. Today, the vortex is probably Chicago, if you look at the concentration of professionals working on ESOPs. I think the center moved because the kind of companies they have in the Midwest are a bit more conducive to ESOPs than the East or West Coasts, since ESOPs are usually leveraged transactions, they require borrowing against company assets, and companies in the Rust Belt have more tangible assets. It's easier for them to engage in a highly leveraged transaction than service-based companies you'd find on the coasts. How did you get into ESOPs? I was working with an investment banking firm in the Chicago office, and one of the investment bankers called me up in 1973, or maybe early 1974. 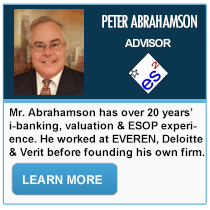 He was trying to do a leveraged buyout, but we couldn't figure out how to do it, because we couldn't get it financed. He sent me an article that he had read, about a way to use the employee benefit assets of a company to get a transaction done. The article was, I think, by Kelso; it was just a proposal to have a provision in the law that would, essentially, create ESOPs. I called him up and said that this isn't the law, it's just someone's idea of what the law should be, so we can't do the transaction you're talking about. But it got me interested in the concept, and lo and behold, six or so months later, ERISA passed, and it included ESOPs. I was a young tax lawyer in Chicago at the time, and I mentioned this to some of my friends as a great way to do a leveraged buyout. I asked some people in the tax bar in Chicago whether they knew how to do this, and of course, they said no. I got a call one day from Wally Blum, who was at the time a tax professor at the University of Chicago Law School. They put a program once a year that covers tax law, and this was a very big conference that year because ERISA had just passed, and they were going to focus on a lot of the ERISA provisions that had just been enacted on Labor Day of 1974. The conference was held sometime in early 1975, and Wally said to me that he'd been calling around to see if anyone knows anything about this ESOP law, but nobody knows anything other than the fact that you're interested in it. He asked if I would like to present a paper at the University of Chicago Tax Law Institute in 1975. I told him that I didn't know anything about it, and the reason I've been talking about it is that I'm trying to find someone who knows something about it. He said that nobody knows anything about it, since the law just passed – there are no regulations, no cases, nothing written about it, and it's just a matter of figuring out how this works. I agreed to do a paper, and presented it at the conference. I didn't even know at the time, but they publish all the papers, in a publication called Taxes magazine. At the time, this being before Google and Lexis-Nexis or anything like that, if you were a lawyer or accountant or anybody in such fields, and you wanted to do some research on a tax issue, you would go to a book that was published by CCH, called the “Index to Tax Periodicals.” You'd have to look in a paper index and prowl around, and if you wanted to find an article on ESOPs, you would look in that index and find only one entry – my paper. Back then, they weren't transactions, they were just employee benefit plans. Have you read the Capitalist Manifesto? I had not read the Capitalist Manifesto at the time, although I have read it since. I wasn't an ideologue, I was just a dedicated tax lawyer. Roland and Kelso believed in the concept, but that wasn't my approach. They had a genuine interest in trying to better the world, and they thought that this was a way to do it, and that wasn't my motivation. My motivation was to serve clients and to build my practice. You're also a family business attorney. Can you share a story that relates to forming or managing an ESOP in the family business context? Again, I have a lot of difficulty talking about specific cases, but I can give you a composite. I don't have two practices – I work with ESOPs and family businesses, but these are the same clients, and the same companies. 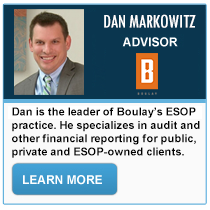 Not all ESOPs are family companies, and not every family business has an ESOP, but they're the same kind of companies, and very often – about 90% of the ESOP companies – are family owned to one extent or another. It's not surprising, and is actually expected for the following reasons. A typical family-owned business has a number of characteristics. One would be that the founder has built it up over a 40-year period. He's now in his 60s or 70s; he has a son or daughter, or often more than one, who is active in the business. He is now approaching the point where it's time to cash in his chips – he needs to generate liquidity, he needs to diversify ownership, he needs to pass on the company to the next generation, both of the family and the management. The alternative would be to sell the whole company, but that's the last thing he wants to do, for a number of reasons. One is that his identity is all wrapped up in it and he wants to keep a hand in it; and more importantly, his family is working there, and they would get fired if an outsider bought the business. Often, he also cares about his employees the same way, since they've been together for his whole life. Case number two is when the founder dies and leaves his company to his kids, one or more of whom work for the company. Time goes by, and some of them continue to work for the company, while others go on to do other things. There's a pattern where the kids who're in the company want to take all the profits and plow them back into the company, and the other kids... You'll have a dentist in Pocatello, Idaho, or a doctor in Charlotte, North Carolina, and all that they want out of the company is dividends; and more than that, they want the company to be sold. They're not active in management. Again, there's a need liquidity in order to buy them out and keep the company independent and in the hands of the people who run it. This goes on and on for generations in a family business – there are always these typical recurring patterns that exist. Well, an ESOP is a very good solution to those issues. An ESOP works for the founder to generate liquidity and diversification while leaving him in control of the company and facilitating his ability to turn it over to his kids or the next generation. If the founder is gone and you have that dichotomy between the inside and outside family members, an ESOP is a way to resolve that so that the inside family members can continue to run the company and get rid of the outside family members, making everybody happy and generating the liquidity and diversification required. So very often, an ESOP is a very good solution for a lot of the typical issues that arise in family-owned businesses. 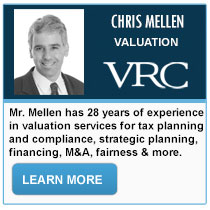 I backed into the family business practice because I found, more and more, I was working with family-owned businesses. One day I sat down and I thought, “Why is this?” And I realized it was because of the recurring patterns. Do you find that at some point there's a phrase that often leads to suggesting an ESOP as a solution? I don't know if it's really expressed that way. Today, one of my partners called me up and said that he has a company he's been struggling with, and he's finally concluded that the owner really just doesn't want to sell, since it's a family business and he's all wrapped up in it. We talked about using an ESOP as a way to deal with that. It's such an ongoing recurring theme, but people don't call up and give some magical incantation that triggers this. It's just a matter of experience. I'm like the doctor sitting in my office, people come in and they keep saying, “I have a stomachache over here on my right side, and I can't figure out what it is,” and after a while, you figure, “This guy needs an appendectomy!” With ESOPs, I feel like that doctor right now. 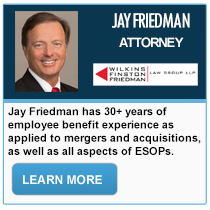 When ERISA passed, ESOPs were just an exception. The way it really happened was: Kelso got the ear of Russell Long, who was the chairman of the Finance Committee. Whatever his motivation was, he really loved this idea, and in later years, it would become one of his hallmarks, to always push ESOPs. Now, what Kelso sold to Russell Long was not necessarily an exception to employee benefit rules, he was just trying to sell employee ownership. Originally, they called ESOPs “Kelso's second income plan.” The whole idea was that the U.S. couldn't be competitive just paying wages and we needed a second income for employees. The idea to implant it in the Internal Revenue Code as a part of the pension reform legislation that turned out to be ERISA was Russell Long's. It was a political decision, because that legislation had just been moving along at the time. It really was the square peg that got stuck in the round hole by Russell Long. It's not a particularly comfortable fit, but he grafted it on, and when they grafted it on, they had to create a lot of exceptions and exemptions in the law to make it work. What do you think of Roland's story of Bangert coming up with the name ESOP? Well, a big part of marketing is branding. That's a great story, and definitely represents Kelso's personality. Did you ever work with John Menke? I've worked with him. I can't say that I have any particularly interesting stories. I mean, he's a very bright guy, and I have a great admiration and respect for him. He was one of the pioneers, he was there before I was in this area, but I can't really say that I have any stories that would be of interest to anyone but him and me. He's a great problem-solver. John's attitude is, if there's a problem, there must be a solution. I've always found him to be cutting through what appear to others to be insurmountable problems, and that's one of the reasons I enjoy working with him.